The sun shone its rays upon the east village on Black Mountain Island; not a breath of wind or a cloud was in sight. Car doors could be heard slamming shut as a dark skinned girl ran to the front door of her home. “Mummy!” she whined as she jumped up and down. “I need to go to the toilet,” she pleaded. Her mother smiled. She rubbed her hand over her daughter’s braided hair before searching for the keys to her front door, she bit her bottom lip noticing the key was not in her bag. While her daughter crossed her legs and jumped up and down she searched for the spare key on the ledge above the door. She sighed as it wasn’t there, but then she remembered that it was under the pot plant to her right and smirked. She lifted it to find the key and opened the door. The girl whizzed past her, straight up the stairs to the bathroom. While her daughter was upstairs she went back to the car to collect her groceries and her phone rang. She tried with one hand to get it out of her bag and ended up dropping her toilet rolls on the pavement. She sighed while picking them up, then swiped her phone screen as she noticed a missed call from her husband. A message then appeared on her screen asking where she was. She walked back into the house carrying her shopping, and cursed as she almost fell over their tabby cat. “Stella!” she shouted as the cat hissed at her before running off into the lounge. After putting her bags down on the granite kitchen counter top she turned to her radio. “Where is it?” she asked out loud as she laughed. Her husband had plugged it in on the other side of the kitchen for some reason. She switched the power on and began unpacking her groceries. She paused as she heard about a woman escaping custody from the police station, deemed dangerous and unstable. What is this world coming to? she thought, as her daughter came running down the stairs. “Mummy,” she giggled peeping at her mother from the staircase. “Can I ride my bike please?” she politely asked as she batted her little eyelashes. Her mum laughed as she saw herself in her six-year-old daughter. Her daughter was already half way out of the back door. As Nirvana rode her bike in the backyard she poured herself a glass of Merlot from the bottle that was already waiting on the table. She took a big gulp before slumping down into one of the chairs. She pulled out a new recipe book and flipped through the pages as she stretched out her legs. She contemplated making Beef Wellington. The fact that it was always a challenge for her to get the beef fillet just right did slightly put her off though, but she was an optimist. “We will try tomorrow,” she spoke to herself as she got up. “Damn it!” she moaned as she spilled some Merlot on her white jeans. She kicked off her heels and took her jeans off. She stood in her underwear while soaking the stain in her sink. Her daughter returned and laughed at her silly mother. “Do I still have time mummy?” she asked as her mother looked at the clock. “Fifteen minutes,” she said, “and stay away from the garden gate,” she warned her daughter. “Mummy where did your jeans go?” she asked mischievously. Her mum grinned as Nirvana waved goodbye to her and ran back outside. She blotted the stain with soda water and then decided to leave it in the sink for a while. She walked to the pantry and became agitated as she noticed her husband had been rearranging things in there as well… then she could not remember what she had gone into the pantry for. Maya laughed as her head was feeling slightly fuzzy. One glass and I’m buzzing she thought to herself as she walked back into the kitchen. She looked at her daughter playing in the garden through the kitchen window. Maya walked up the stairs to get changed but felt disorientated; she made her way into her bedroom and stared at her large antique cupboard. She stripped off her bright orange top and found a teal tunic dress to slip on. She turned to admire the embroidery on the dress before returning downstairs into the kitchen. “Nirvana!” she shouted knocking on the window. “Time to come inside,” she ordered, as her daughter rode up and down ignoring her mother. Her attention was drawn to the front door as she heard someone knocking. Maya opened the door to find no one there. “I’m hungry Mummy!” her daughter shouted from the back door. As she turned her back to the door, she gently pushed it and then walked away, without realising that it was now left ajar. She walked into the kitchen where Nirvana was sitting at the table. “I’m so hungry,” she told her mother, hitting her tiny hands on the counter. The little girl ran out of the kitchen and up the stairs towards the bathroom. Maya searched her bag once again as she heard her phone ringing, yet again she got to it too late. Her phone beeped as a voice message popped up on her screen. She swiped the button as she poured herself another glass of wine. “Maya,” she heard her husband’s voice, “Where are you?” he asked. She laughed, thinking about how paranoid he was, just because she never made it to her phone on time he probably thought she was dead in a ditch somewhere. She sent a message to her husband explaining that she was at home but as she sent it her phone died. “Where’s my charger?” she moaned as she looked for her phone charger. “I’m ready mummy!” Nirvana shouted from upstairs. Maya put her phone on the counter and walked up the stairs to find her daughter standing next to the bath which was almost overflowing with bubbles. She laughed and checked the temperature of the water before she bathed her child. As she dried her off she wrapped the towel around her and draped her over her shoulder. Giggles escaped from Nirvana as her mother galloped into her bedroom. While her daughter dressed in completely mismatched clothing Maya looked out of the window at an old woman standing in the road. The years had not been kind to her face and her hair was not groomed at all. She was just standing hunched over watching the house. “Mummy can you put my slippers on?” her daughter asked. Maya helped her daughter with her slippers and then towel dried her braids. Before they left the room Maya looked back out of the window but the woman was gone. They walked towards the stairs. 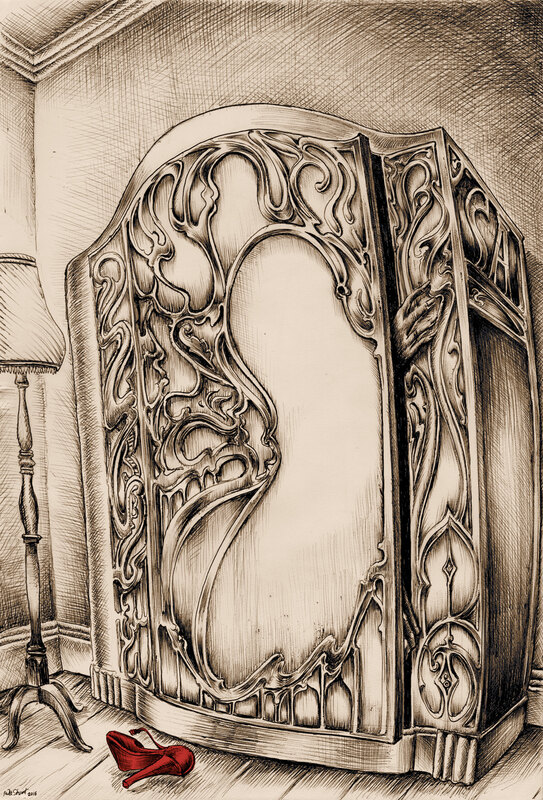 Maya stopped as she heard a door creaking, then walked into her bedroom to find the cupboard door open. She frowned as she walked up to it, closed the door and turned the key in the lock. Maya walked out of the room and again heard the door creaking. She walked back into the room to find the cupboard door open again. She walked up to the door to lock it but the key was gone, she looked down at the key lying on the baby blue plush carpet. As she bent down to pick up the key a hand from beneath the cupboard grabbed hers. Maya shouted out in shock as she leapt backwards. She stood and stared at the cupboard for a moment; tiny beads of sweat began to form on her forehead as Nirvana came into the room. “Mummy!” she moaned, “What are you doing?” as Maya picked her daughter up and left the room. She shut her bedroom door behind her as she made her way hastily down the stairs. Maya knew she should not have been drinking since she was on antidepressants. She remembered how close she was to losing Nirvana during her pregnancy and how it caused her to spiral down into a dark depression. She had hallucinated in the past but nothing had ever felt so real as it just did. “Put me down silly,” her daughter said pulling her mother’s cheeks as she giggled. Maya put her daughter down and picked up the half empty glass of Merlot. She poured it down the drain then ran the tap for a while. She looked up at the time. It was five thirty and her husband would be home by seven. Maya looked for something easy to prepare as Nirvana pulled playdough out of her backpack that was lying next to the stairs. As she kept herself busy Maya began to boil some pasta as she put minced meat on the stove. “Spaghetti bolognaise,” Maya sang to her daughter. “That’s my favourite, mummy,” she declared as she rolled out her bright yellow playdough. Maya heard a knock on the door, she walked out of the kitchen and switched on the light in the passage as the sun was setting. She noticed the door was ajar, she cautiously opened it to find no one there again. This time she shut it tight and locked it before going back into the kitchen. Maya walked over to the sink and retrieved her wine glass; she poured herself another glass knowing that she shouldn’t, but she was feeling more anxious than normal. She sat beside her daughter and sipped her wine, she had forgotten that her phone battery had died and just watched her daughter have a discussion with what looked like a duck she had formed out of the playdough. Maya’s eyes were becoming heavy and her head began to drop back as she drifted off. She jolted as she sat upright, a puff of rancid smoke came from the pot and pan on the stove. As she pulled the pan with the burnt mince off of the stove she looked at how the water had all boiled over and out of the pot with the pasta, the kitchen smelled horrendous. She looked up at the time, it was eight o’clock. “Nirvana!” she shouted out as she looked at the playdough lying scattered on the grey floor tiles. Maya ran towards the lounge to look for her daughter, she flipped the light switch but her daughter was not there. She ran up the stairs and searched her daughter’s room, picking up another piece of playdough from the bedroom floor. Maya cautiously turned around in Nirvana’s room as she heard the cupboard door creaking. She slowly walked from her daughter’s room towards hers, pushing open her door to find the cupboard door wide open. “Nirvana,” she whispered as her clothing on the hangers moved slightly. “Nirvana,” she raised her voice as she stormed towards the cupboard, she began ripping the clothing off of the hangers until there was nothing left. “Nirvana!” she screamed as she ran out the room and back down the stairs. She made her back to the lounge and looked behind the sofas because she knew Nirvana loved to play pranks on her. Frantically she passed all the photos in their gold frames as she rushed to the back door. She walked out into the garden. It was already dark but her daughter was nowhere in sight. She broke down as she re-entered the house, then cried uncontrollably as she searched the entire house again. Maya walked into the bathroom and found some soil smudged into the beige carpet. “Please Nirvana!” she pleaded as anxiety took hold of her. She began to feel dizzy as her heartbeat pounded in her chest. With every beat panic filled her soul, the realisation began to set in that her daughter could be in danger. She made her way back to the kitchen, searching for a phone charger and grabbing her phone. She ripped open the drawers but nothing was in its place. The drawers fell crashing onto the tiles as she desperately rummaged through them. Maya stared through the kitchen window as she heard the gate open, she sank slowly down towards the ground as two large dark figures made their way towards the back door. Maya crawled to the light switches and stretched her arm up the wall, switching off the downstairs lights. She could hear whispering voices. Maya then crawled as fast as she could towards the back door. She shook as she turned the key locking the door. Maya could hear footsteps approaching as she rested against the door in the dark. She whimpered as the door handle began to rattle. She crawled backwards towards the kitchen. She looked up through the back door’s cottage panes as the dark figures dispersed. As Maya crawled on the cold tiles she stumbled across a large carving knife. She grabbed onto it and held it close to her chest as she heard glass breaking upstairs. She stood up and ran towards the lounge as someone started banging on the kitchen window. Maya switched off the light before she lay her back against the wall in the corner, sliding down behind the sofa as she heard someone walking upstairs in her daughter’s room. Heavy footsteps made their way from Nirvana’s room across to hers, and then her hands began to sweat as she heard the top stair creak. She silently cried as she heard someone walk down the stairs. The light glowed from the kitchen as she heard the switch click; she watched as a shadowy figure made its way to the lounge door. She gripped onto the carving knife as they stood in the doorway. She held her breath while hearing the back door rattle, the figure darted off towards it. Maya slowly stood up, she was bewildered and did not know what to do. She crept across the lounge floor towards the door, she heard voices as the back door was opened. She stood with her back against the lounge wall and waited in the darkness. The stairs creaked as she heard someone running up them. Maya could see a shadow approaching, thanks to the light from the kitchen. She gripped the carving knife handle tightly in her right hand as she put it up to her chest. “No one is upstairs,” she heard a man shout from above as a hand stretched around the corner in the dark, feeling for the light switch that was not even a centimetre from Maya’s arm. As the intruder’s fingers touched Maya’s elbow she struck her arm around the corner, the carving knife jolted as she felt it slowly sink into the person. Maya could hear a slow groan as she pulled her hand back with the carving knife left behind. She heard a loud thud and looked to find a woman lying on the floor, the carving knife went through her neck. The woman was trying to call the man, but no words only blood bubbled from her mouth, she pointed towards the top of the stairs as Maya pulled the carving knife out of her throat exposing her oesophagus. Maya needed to find Nirvana and if that meant killing the man upstairs she would do it. The woman grabbed Maya’s leg but her strength had already left her. Her hand dropped to the ground as Maya walked towards the stairs. Maya crept up the stairs; she cringed as the top stair creaked. From her bedroom came the man; he ran towards her shouting. She tried to run into her daughter’s room but he grabbed her and bashed her spine into the corner of the door. She dropped the knife as he grabbed her by the hair and pummelled her head into the wall. The sound of the man’s heavy breathing eluded Maya’s ears as it was replaced with an incessant ring. She looked at the man’s face as he began choking her, the fear in his eyes made no sense. Maya managed to dig her right thumb in the intruder’s left eye. He screamed out as she felt her thumb become enveloped by a warm mushy substance. He let go of her as she looked at the remains of his eye on her thumb. She frantically grabbed the carving knife as he began running down the stairs holding his left eye closed. Maya ran after him and sunk the knife into his neck half way down the stairs. He stood still as she twisted it and shoved it in deeper. Maya screamed out as her body went into survival mode, it was kill or be killed, she cried as the man dropped to his knees and then tumbled down the stairs. She watched as the man got onto his haunches, he shouted as he stretched his hand back and pulled out the carving knife. He stood up and looked at the woman lying on the ground, he whimpered and then rage filled his screams. “I’m going to make you wish you were never born,” he threatened as he began walking back up the stairs. Maya ran into her bedroom, she looked at her cupboard as it slowly creaked open; confusion filled her mind as all her clothes were back on the hangers. The man entered the room, the lightbulb burst when he tried to turn the light on. He looked at the antique cupboard and observed the door was moving slightly. He slowly crept up towards it, with carving knife in hand he stood before it. He lifted the knife as he used his left hand to open the cupboard door. He slashed with the knife fanatically before he ripped the clothing out of the cupboard to find she was not there. “Hey,” Maya whispered behind him. As he turned she struck a five-inch stiletto heel into his ear. She heard a crack as he dropped to his knees. Maya turned to her dressing table and grabbed an oak jewellery box. She struck the man against his head before repeatedly striking the box against the heel that was lodged in his ear. She screamed out striking the box down one last time and finally stopped when the heel protruded out of his right eye socket. She threw the jewellery box down, she cried bitterly for what she had done but more so for her daughter. Maya walked towards the stairs, she looked down at the front door as a blue light shone through the front windows. The step creaked as she stood on it, Maya began to lose grip of reality as her front door was broken down. She watched as armed police entered her home, with guns in hand they surrounded the bottom of the stairs. The police Sergeant of Black Mountain walked in as Maya took a step down towards them. “Stay where you are,” she cautioned Maya. “My daughter,” Maya whispered, as she ignored the warning and walked down to the next stair. The Sergeant told her unit to stand down as she pushed through. “Are you Maya?” the Sergeant asked as she walked up onto the first step. Maya nodded, “My daughter,” she repeated herself. “Sergeant Moffatt,” the Inspector said to the Sergeant as she rested her hand on her handgun. Maya broke down as she held onto the hand carved wooden balustrade. Sergeant Moffatt slowly walked up the stairs, her trigger hand at the ready. Maya sobbed for her daughter as the sound of a car could be heard pulling up. Maya looked to the door and saw her husband; she cried out as she put her hands out to him. But he stood there in apprehension, “Maya,” he said as the police Sergeant cautioned him not to come up. “What have you done Maya?” he asked. Maya was making no sense, she hit her head into the balustrade as she cried for her daughter. Sergeant Moffatt stood down as the man explained to her who he was. “I am her psychiatrist,” he explained to which Maya seemed confused. “Why are you saying that?” she screamed at him, as he made his way up to her. “Why are you lying?” she shouted, as he grabbed hold of her. She sobbed as he held her. “You need help Maya,” he said as he tried to console her. Sergeant Moffatt opened the holster to her gun as Maya became agitated trying to push the man away. “You are my husband!” she shouted repeatedly. “Where is Nirvana!” she wailed. They began to struggle on the stairs, so the Sergeant pulled out her gun but she was hit back by the psychiatrist as Maya pushed him. She had had enough; the blonde Sergeant might have been petite but she was as tough as nails. She walked up the stairs and grabbed Maya by the extensions in her hair, she pushed her face down onto the carpeting of the stairs as she handcuffed her. As they detained Maya she begged for them to search the house for Nirvana. “She is hiding away because she is afraid,” she assured everyone. They all looked at the psychiatrist to which he just shook his head. As they took her down the stairs Maya looked into the lounge, now with the lights on she noticed the picture frames had people in that looked familiar, people that were not her. As the body bags were being removed, Maya realised the people in the pictures were the intruders in her home. “They broke into my house!” she screamed, as she was pushed towards the front door. “Don’t you remember me?” the Sergeant asked to which Maya looked at her with a blank expression on her face. “You broke out of my custody this morning,” she explained, “This is not your house. You do not have a child,” she continued, as the psychiatrist tried to console Maya. She screamed as the Sergeant was putting her in the back of the police car. “They were intruders in my home!” she yelled, convinced that she had done nothing wrong. “You were the intruder!” Sergeant Moffatt shouted at her. “You came into their home and killed them for no reason,” she declared, as she pushed her into the car and shut the door. The psychiatrist asked for immediate transfer to the hospital but the Sergeant wasn’t having it. “We will see what the Chief Inspector says down at the station first,” she said, as she climbed into the police car. She pulled away with Maya screaming in the back of her police car. The psychiatrist followed suit, as the remaining police officers put up police tape marking out the crime scene around the house. A few hours later the smell of blood was still fresh in the air, a light flickered on and off in the kitchen as the radio switched on. The sound of silence played as a child could be heard giggling upstairs.